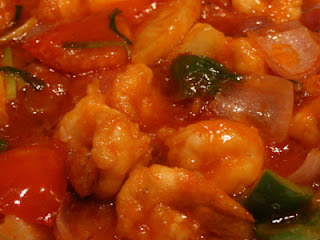 Marinate prawns for 20 minutes in egg white, cornstarch, salt, water and oil. Mix together the tomato ketchup, sambal oelek, MSG, sugar, rice wine and cornstarch. Peel garlic and ingwer and chop finely. Also chop scallions finely. Heat 3/4 litres oil in a pan or wok and fry half of the prawns. Take them out of the pan after 45 seconds and drain them. In another pan or wok put 5 tablespoons of oil and fry garly and ginger for 30 seconds. Add prawns and fry while stirring constantly. Add prepared sauce and fry for 1 minute. Add chopped scallions and 2 tablespoons oil.